Initial results from Club DSPORT’s ongoing FA20 engine development program make a strong argument to stop the swap. How does over 560 wheel horsepower at 6,500 RPM and over 475 ft-lbs of torque at 5,750RPM sound from a turbocharged 2.1-liter FA20 on pump E85 with the manners of a stock engine? That’s just the beginning, as Club DSPORT will be pushing the 2.1-liter harder while also initiating the testing on its 2.25-liter FA20 that will have additional output and power handling capabilities. To fully comprehend Club DSPORT’s engine development process, it’s necessary to first understand the FA20 in its “as-delivered” form. Many mistakenly believe the BRZ and WRX versions of the FA20 to be similar with the exception of compression ratio and the presence of a turbocharger. In reality, the differences are vast including the block, heads, pistons, rods, valves, camshafts and oil pumps. Most parts will not interchange. Before grading the FA20 in its stock form, it’s important to understand that there are two very different versions of the engine. The FA20D (often referred to simply as the FA20) is the 200-flywheel horsepower naturally-aspirated version found in the BRZ, FR-S and 86; while the FA20F (mistakenly referred to as the FA20T, since it is turbocharged) delivers nearly 270-flywheel horsepower. Many people assume that the only difference between the two engines are the compression ratios and the presence of a turbocharger. In fact, there are more differences than similarities between these two engine. The blocks, heads, pistons, rods, valves and intake manifolds are unique to each platform. While this obviously raises production costs, it allows Subaru to optimize each engine for its specific usage. WRX heads feature small high velocity ports to reduce turbo lag and improve response. 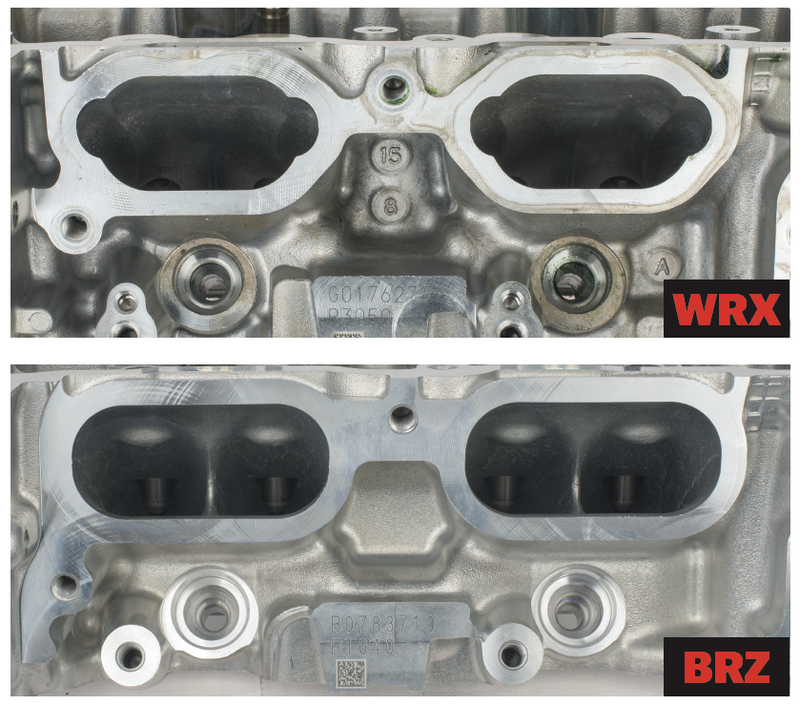 BRZ cylinder heads have larger, higher flowing ports based around larger valves. This is one reason why the WRX engine makes peak power at a lower RPM. Subaru engineered the FA20D to be an extremely efficient 2.0-liter with exceptional volumetric, mechanical and thermal efficiencies. At the wheels, the 2.0-liter delivers roughly 170 horsepower at 6,700RPM while managing to crank out nearly 150 ft-lbs of torque. 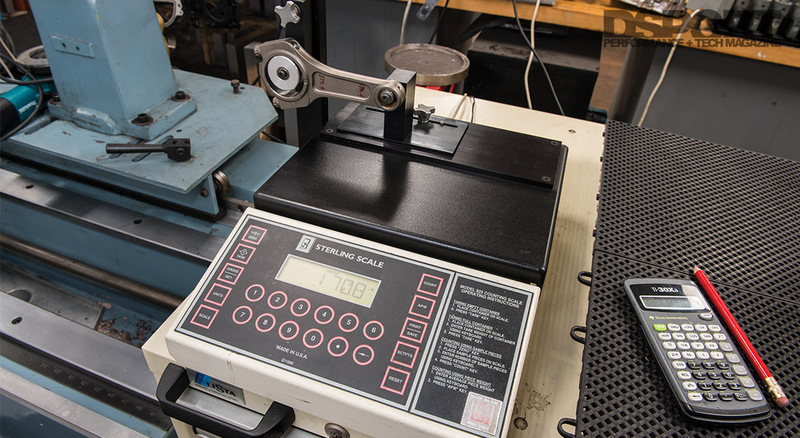 While these numbers may not seem all that impressive on their own, a look at the torque curve that delivers nearly 90-percent of peak torque from 2,500 to 7,000 RPM is quite an achievement. While this torque curve is ideal for the street or the track, it doesn’t have the psychological impact of an F20C VTEC Honda engine that has a peaky and short torque curve that doesn’t get things going until the upper reaches of the S2000’s LED tacho. Hence, many complain that the BRZ, FR-S and 86 severely lack power. In reality, the broad and flat torque curve simply makes it feel like it lacks power. 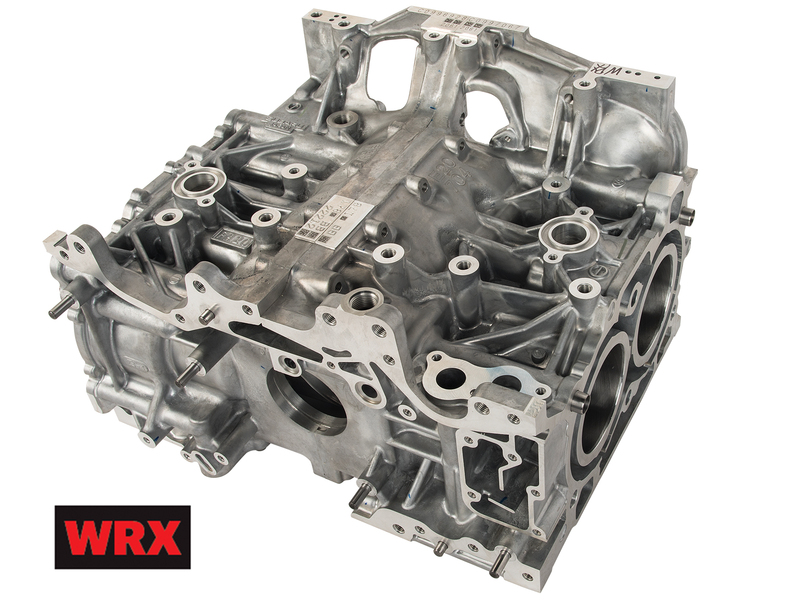 While the BRZ heads are superior for flow, the WRX heads are better for combustion efficiency. The twin quench pads help reduce detonation. 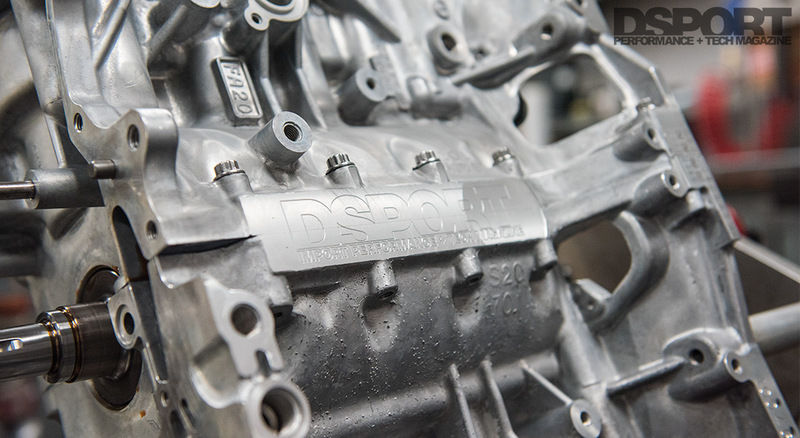 The ideal combination of the WRX combustion chamber with BRZ ports and valves is currently in the works at Club DSPORT. In developing the turbocharged cousin to the FA20D, Subaru engineers focused on making the FA20F a turbocharged 2.0-liter with the output characteristics of a 4.0-liter V8. This meant making the 2.0-liter behave like it was twice its displacement. To accomplish this, a priority was placed on getting the engine into boost as quickly as possible. In addition to sizing the turbocharger accordingly, the intake manifold, cylinder heads and even intake and exhaust valves are much smaller than the FA20D to keep flow velocities higher. Camshafts and cam timing are also skewed for response and low-speed efficiency. As a result, the FA20F delivers its peak power at 5,600RPM instead of the 7,000RPM for the FA20D. The small-ports that make the FA20F so responsive and effective at low engine speeds are also what limit its top-end power. 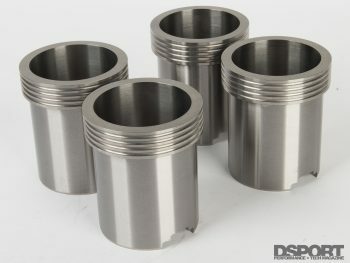 Club DSPORT uses dutile iron sleeves from LA Sleeve or Darton Sleeves to increase the FA20’s bore size from 86 to 89mm. The 89mm bore and 90mm stroke combination takes dispacement to 2,240cc. There are a number of technologies incorporated in the FA20 family of engines that make them a good foundation for high-performance. While a number of modern engines are incorporating direct injection to allow performance and efficiency improvements, Toyota’s D-4S injection adds conventional port injection in addition to the direct injection. By employing port fuel injection, the problem with intake deposit formation which plagues direct-injection engines is completely avoided. In addition, the system allows for the aftermarket to easily upgrade the port injectors to higher flow rates when needed for higher power applications. 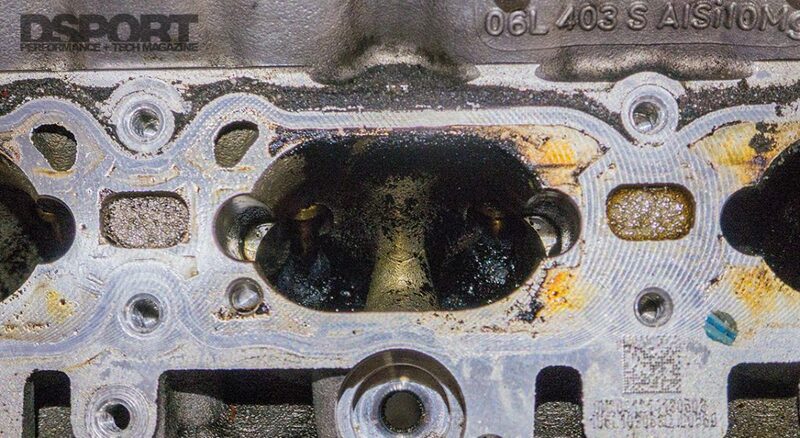 Here is the intake port of a 2.0L turbocharged VW engine after just 14,000 miles. Since the engine is direct-injection only, there is never any fuel injected into the intake port to keep the port and intake valve clean. As a result, these massive deposits form, killing airflow and affecting performance. Another common strength across the FA20 family is the drastically increased cylinder strength compared to the EJ257. 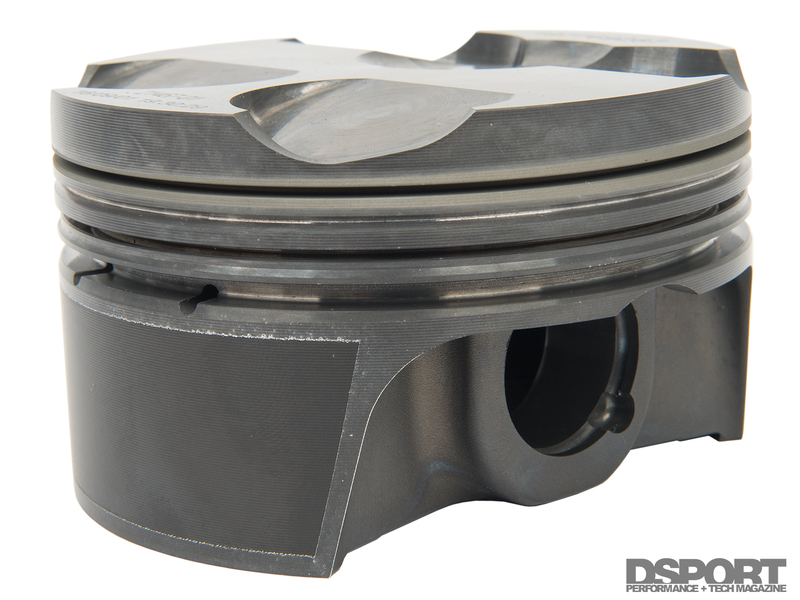 While the cylinder bore spacing is identical between an FA20 and EJ257 engines, the smaller cylinder bore diameter of the FA20 allows for thicker cylinder walls. These thicker walls should be able to contain higher cylinder pressures before failure. 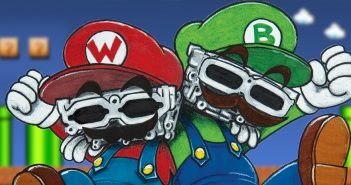 Both FA20 engines feature connecting rods that are the weakest link to increased power handling. The FA20D rods seem to have enough strength to support the bulk of bolt-on supercharger systems with proper tuning. Unfortunately, going beyond 300 horsepower at the wheels or having a tune that induces some knock can quickly put one of these rods through the side of the block. Having a staff that’s built over 500 EJ257s makes us pretty familiar with the good and bad with Subaru boxer engines. While the precision of Subaru’s machining of the engine isn’t the worst of any OEM, it’s definitely not at the top. As such, there are significant improvements to be realized by increasing the level of precision with the machining. ARP case bolts and head bolts are key to increasing the power handling capabilities of the FA20 engine. Since these fasteners increase clamping loads additional distortion to the block can occur. CNC line boring and cylinder honing with a torque plate correct the additional distortion. All Club DSPORT FA20-based builds start with a brand new FA20 bare block sourced from Heuberger Subaru of Colorado Springs, Colorado. In our experience, Heuberger can’t be beat in terms of pricing, having items in stock and affordable, fast shipping. Best of all, Heuberger supports the scene through the sponsorship of the IDRC’s Colorado event. When the new block arrives, measurements of the main bore alignment is conducted. This process will determine whether or not the case halves will require machining before the line boring operation. A full set of ARP high-performance case bolts are torqued to spec before the line boring operation. 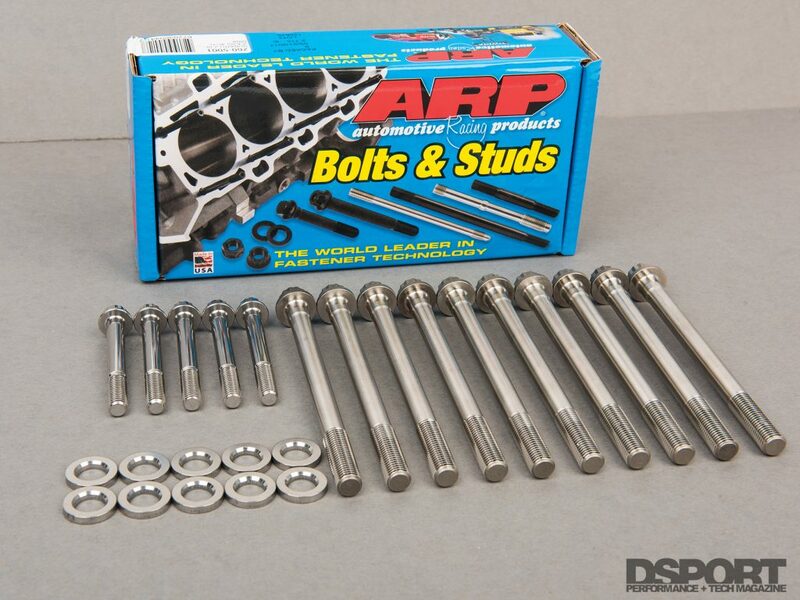 The ARP case bolts are made from a higher-grade alloy that allows the clamping force to be increased. 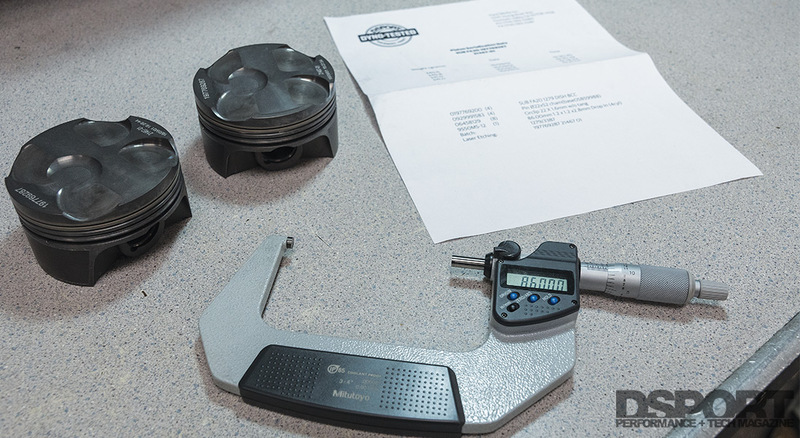 Since there is currently no aftermarket oversized outside diameter bearings for the FA20 engines, the process is extremely tedious and time consuming, as setup requires an alignment within a couple ten thousandths of an inch. That’s about 1/10 of the diameter of the thinnest hair on your body. Special PCD cutters are used to produce an exceptional finish once the cutting process is initiated. Club DSPORT’s optical tool setter allows for extreme precision in setting the tooling. Once the line-boring operation is complete, the block is disassembled and then reassembled with the 2.0000” bar in place. This bar allows the engine to be placed in the 4-axis engine machine center for boring, clearancing, sleeve machining, decking and engraving operations. 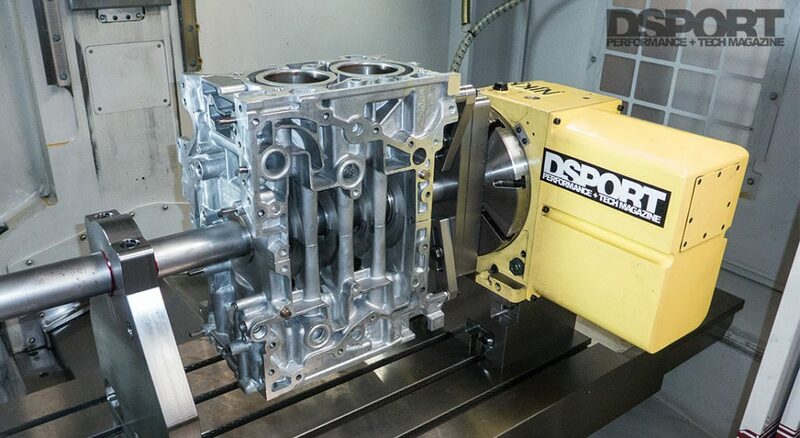 Blocks maintaining the original 86mm bore will only require the parallel decking and engraving operations (to identify the block as a Club DSPORT Reference series engine). The parallel decking operation ensures that the distance from the centerline of the crankshaft to the deck of the block is identical on both banks of the boxer engine. This line boring operation and parallel decking operation provide a geometry that ensures that the piston-to-deck clearance is identical in every cylinder. In turn, the final static compression ratio for each cylinder becomes more consistent. 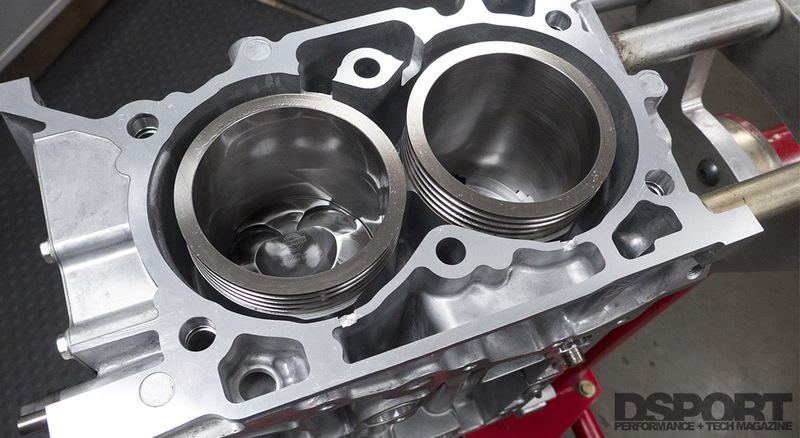 Once CNC machining is completed on the block, it’s time for the honing of the cylinders. Club DSPORT is in the process of evaluating all of the currently available high-performance sleeve offerings for the FA-series engine. In the past, Club DSPORT has had excellent success with offerings from both Darton Sleeves and LA Sleeves on various types of engines. For the FA-series engine, Club DSPORT will be building the FA225 editions with either sleeve design based on the customer’s preference. Custom-spec sleeves from both suppliers will also be made available for special applications. The deck surface of the block is machined with a PCBN cutter before being lapped to a super smooth finish for the MLS head gaskets. OEM head gaskets are used on the FA20 and FA21 iterations while an HKS 90mm head gasket is used on the sleeved 89mm bore FA225 engines. In addition to the correction of the placement of the crankshaft centerline in the engine and the equalization of the deck heights in the engine, the biggest difference between a factory machined Subaru engine and a Club DSPORT reference engine can be found in the cylinders. Ideally, the cylinders of the engine (once assembled) are as round and taper-free as possible, while sporting an ideal surface finish to work with the piston and the piston’s ring package. To achieve this, Club DSPORT experimented with different torque plate designs (aka honing plate) until a design was finalized that exactly simulated the distortion effects of bolting the heads to the block. ARP head studs and either a factory (FA20 and FA21) or Cosworth 90mm head gasket (FA225) is used when bolting the torque plate in place. With the cylinders now subjected to the same stresses and strains that will be realized on the completed engine, the cylinder is honed using a special diamond abrasive to a final dimension of 86.05mm or 89.00mm (the spec for the custom pistons). Cylinder roundness and taper is held to under 0.0004” while the surface finish is equalized and optimized in each bore by using a profilometer to measure the surface. At the end of the honing process, only a small amount of deburring takes place before the block is jet-washed, ultrasonically cleaned and then hand cleaned to a ready-to-assemble state. After the measurements for straightness and journal dimensions, each crankshaft is dynamically balanced to less than 0.25grams of balance. While the Club DSPORT FA20 uses a standard 86mm OEM crankshaft, both the FA21 and FA225 iterations from Club DSPORT utilize the same forged-and-nitrided stroker crankshaft. The made-in-Japan crankshaft features a +4mm stroke (90mm) and precision-graded main and rod pins. The crank is fully heat-treated and nitrided for superior strength, fatigue-resistance and journal-surface hardness. Most of the Club DSPORT FA-series engines currently in the field feature crankshafts that have been processed with Shaftech’s Omicron surface treatment. This hyperfinishing process produces a superior surface finish that eliminates the microscopic machining and grinding marks normally present. 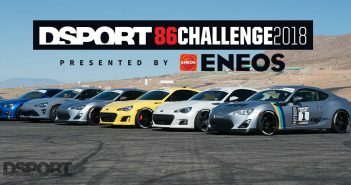 Although Club DSPORT has not conducted its own testing of the process, other parties have seen power gains and friction reduction with similar processes. 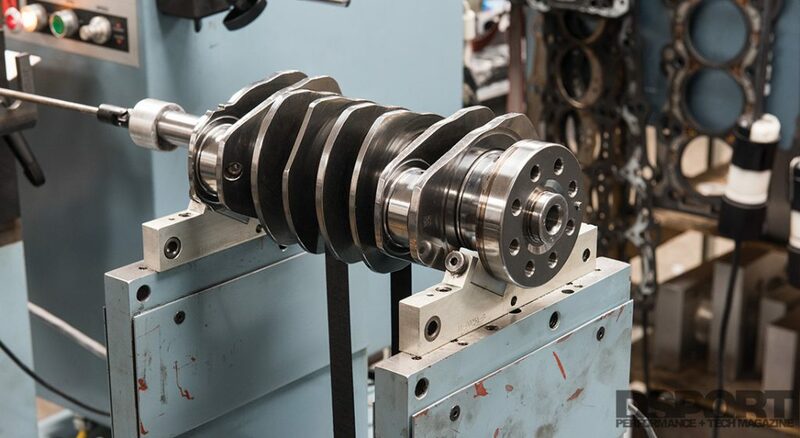 Each crankshaft is dynamically balanced to less than 0.25 grams of imbalance. Each and every piston is matched in a set of like dimension and weight pistons before being final balanced. Each Club DSPORT Reference-series FA engine has a unique piston design. All three piston designs have been engineered by Mahle Motorsports to deliver peak performance, reliability and efficiency for each engine version. Thanks to Mahle’s extensive OEM supplier relationship, its design engineers are well versed in creating a piston dome shape optimized for the direct-injection environment. The pistons have also been optimized for use with E85 fuels as the top ring lands have been hard anodized for additional strength and resistance to microwelding. Pin offsets and skirt design, as well as the ring package have also been selected specifically for high-power handling, extended engine life and increased efficiency. While the power handling limits of the pistons have not been documented, computer models and experience with like 86mm pistons (i.e. RB26 and Supra) suggest that power handling in the 200-plus horsepower per cylinder should be easily achievable. 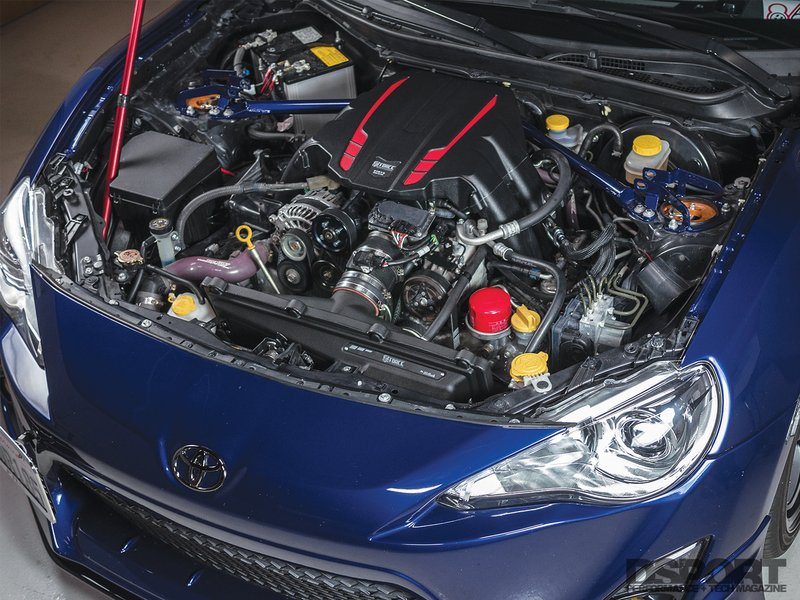 Static compression ratio will be between 10.7-to-10.8:1 with BRZ heads and 10.9-to-11.0:1 with WRX cylinder heads. 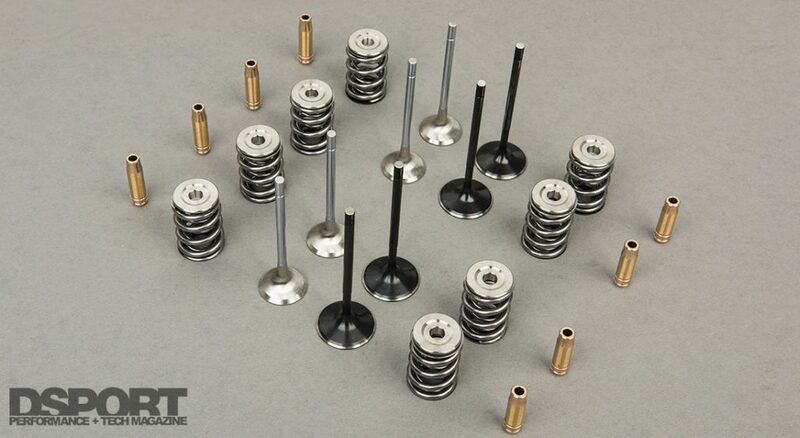 Before installation, Club DSPORT balances each piston and pin set to within 0.2 grams. Each small end and big end is matched balanced in every set and recorded in case a replacement is ever needed in the future. 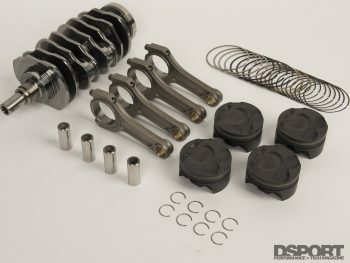 To make the connection between the crankshaft and piston, the Club DSPORT FA20 Reference Series engines use the off-the-shelf Manley Pro Series I-beam 4340 connecting rods fitted with 3/8-inch ARP2000 rod bolts. For the Club DSPORT FA21 and FA225 engines, a custom Manley Pro Series I-beam connecting rod is used. The rods are designed to support 250 horsepower per cylinder. Before installation, Club DSPORT balances each rod’s small and big end to within 0.2 grams. Once all of the components are in a ready-to-assemble state of cleanliness, all of the critical measurements are recorded during the assembly of the shortblock. These include all crankshaft journal dimensions, bearing clearances, crankshaft end play, rod side clearance, piston ring end gaps, piston-to-cylinder wall clearance, piston-to-deck height and torque required to rotate the completed short block. 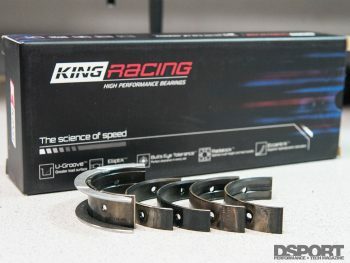 In most cases, King Racing XPG main bearings are used with Clevite rod bearings. However, if the ideal oil clearances cannot be achieved with this combination, ACL or OEM bearings may be substituted. In most cases, clearances are set-up for SAE 0W-40 viscosity oil. A complete Supertech valvetrain including black nitrided stainless steel intake and Inconel exhaust valves replace the factory hardware. Supertech springs, retainers, seals and keepers complete the upgraded valvetrain that’s orchestrated by HKS camshafts. While the short block program is completed, the cylinder head program is still a couple months from completion. The FA21 dyno test featured a combination of HKS camshafts with Supertech nitride stainless intake valves and Inconel exhaust valves. The FA225 currently in assembly will be using a Piper Cams BP285 Ultimate Road camshaft set with +1mm oversized valves. The cams are considerably more aggressive than the HKS cams and should be better suited for the increased displacement. Recently, we had the opportunity to put one of the Club DSPORT Reference Series FA21 engines to the test. After the stock engine surrendered at just over 400whp in our Project turbo FR-S, we decided this would be the perfect test bed for the new engine. 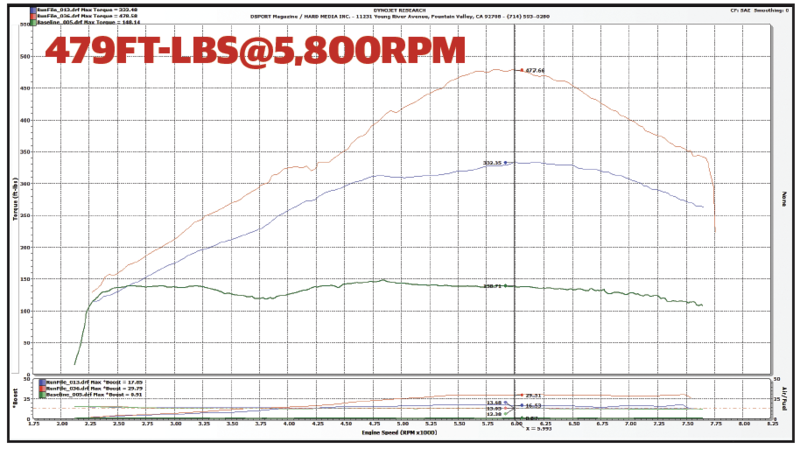 Previously, the Full-Race EFR turbo system helped the stock FA20 generate 412whp at about 6,900RPM. Peak torque checked in at 332 ft-lbs at 6,000RPM. Boost peaked at roughly 15psi while running on E85. With the Club DSPORT FA21 engine in place, we expected to see a torque gain in the 5-to-10 percent range at the same boost levels due to the increased displacement and improvements. At 2,500RPM before any appreciable boost is being made, torque improved from 125 ft-lbs to 160 ft-lbs. That’s a significant 28-percent increase. At 3,500 RPM, torque improved from 215 ft-lbs to 270 ft-lbs; a 26-percent increase. Hence, the FA21 is delivering the response characteristics of a 2.5-liter. Extrapolating that data, the FA225 may have the response characteristics of a 2.7-liter. Stock engine, stock engine with Full-Race EFR7163 kit and Club DSPORT FA21 with Full-Race EFR7163 show the massive gains possible with a properly-built 2.1 liter FA20. No compromises. The current combination shows a torque curve to die for. Best of all there’s still more to be realized once the fuel system receives another round of upgrades. Thanks to the increased power handling and forced-induction optimized compression ratio, we could finally safely increase the boost. With the boost set to 24psi, the FA21 delivered, and delivered big. The power curve peaked at 563whp but had a shape that all the other 2-liter engines would envy. Compared to the factory engine, there was no compromise in performance anywhere from 2,000RPM to the new 7,600RPM redline. 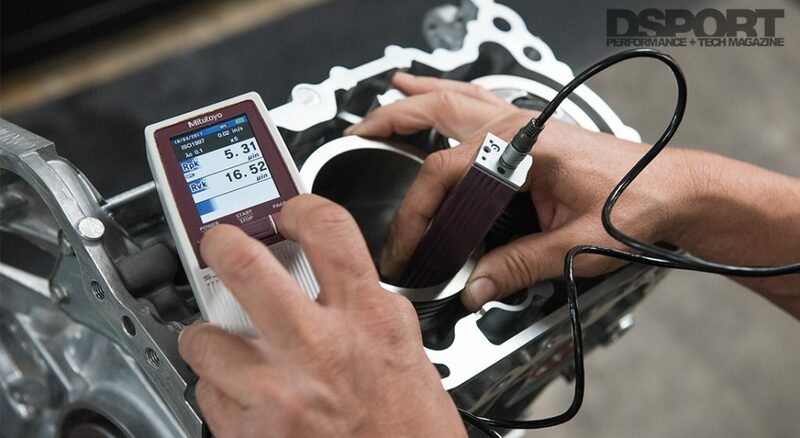 Over 300 ft-lbs of torque is available from 3,700RPM to until you hit the rev limiter. The real sweet spot is between 4,800 and 7,000RPM where over 400 lbs-ft of torque is available on demand. While these numbers are impressive, there’s likely more performance available as we simply ran out of injector capacity to support more power. 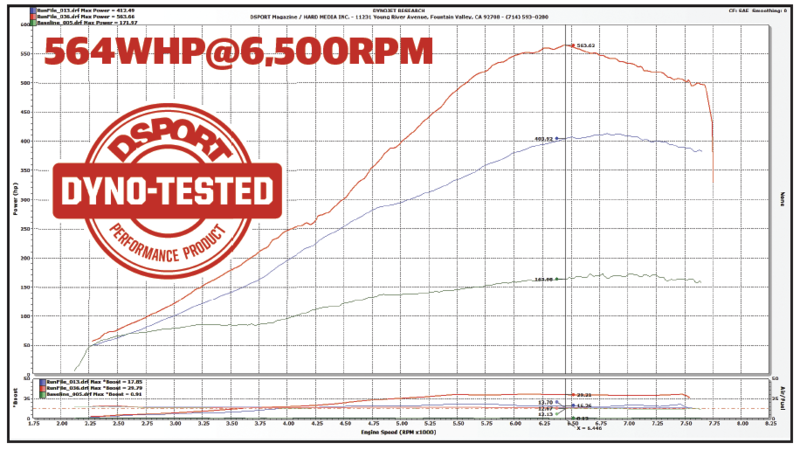 Based on the data, the EFR 7163 should be able to get over the 600whp mark at about 28psi of boost. Once we get our transmission solution in place, we’ll get our turbo FR-S back on the dyno to push it harder. 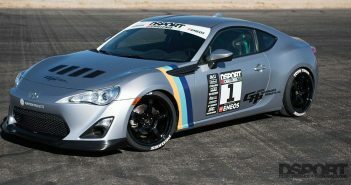 Our Silver FR-S will serve as our in-house tester for the 2.1-liter FA21 version of the Club DSPORT Reference Series program. The 2.3-liter tester will be supercharged. We’ve developed and built 1,400whp RB engines, 1,000+whp B-series Hondas, championship-winning 2JZs and too many other engines to mention. While the sheer power output of the other engines may eclipse the current FA-series development numbers, there is no engine that has exceeded our predictions like the FA21 and FA225. While we are confident in the development up to the 600whp level, we do not know what limitations will be exposed as the 700-, 800-, 900- or 1000whp levels are reached. Considering that a 550whp FA21 or 600whp FA23 would meet the demands of 98-percent of the most ambitious WRX or 86 owner, we need to say, “stop the swap.” If you need more, we are pretty confident we’ll figure out what’s really needed for 700-, 800- and perhaps even 1000whp.